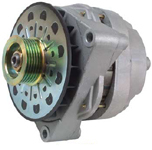 Our most dependable workhorse, we use these high output alternators on Limousines, Off-Road vehicles, and Emergency vehicle command units. You can use them with confidence to provide the high amp power needed for your energy hungry accessories. 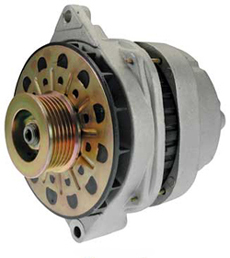 Starting with a GM CS-144 series alternator, we completely gut the unit and build it back with new components that meet our stringent specifications. 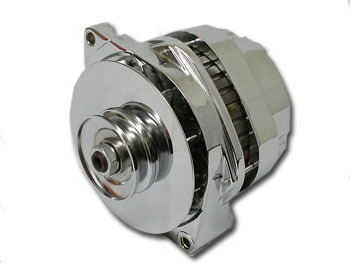 It can be used to upgrade most GM alternators from 1964-2000. An adapter harness may be required for earlier models. Please email your questions concerning applications to us and we will respond quickly. We build these units to provide upwards of 105 amps at an idle. That's as much as the original units put out at high RPM. 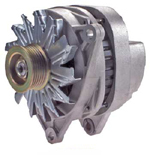 Our high amp alternators are good for applications requiring additional charging capacity such as with auxiliary batteries, stereo systems, off-road lighting, etc. We have wiring harnesses available to adapt this unit to many different applications. Please contact us for specific details. We can also provide this same unit as a 1-Wire (pick the option below) which requires only the battery cable to be connected to the output post on the back of the alternator. These high output units are available in different mounting styles, see pictures below. 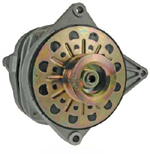 Check in our store for special brackets to use this alternator as an upgrade or a generator conversion. NEW! We now have 300 amp units available.